Boots wet from crossing the river, you tramp up onto the remnants of an old Imperial road. A small village lies before you. Its cottages stand arrayed in neat order along either side of the way, muted and dark. The dinner hour is just passed, but no laughter or chatter distrubs the steady drissle soaking your cloaks. Only the gentle clanking of weapons on armour and the ragged breaths of your band echo in the still quiet. 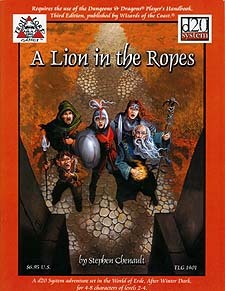 A horror stalks the land, and it is left to you to unravel the mystery that is "A Lion in the Ropes." A d20 System adventure designed for 4-8 characters of levels 2-4. The lands of Lord Galveston are plagued by murders. Rumours abound that a fiend from the Twilight Wood is responsible. When the deacon of Four Saints Church is found floating in the river, the terrified people under Galveston's protection cry out to him for aid. Brave adventurers are needed to delve into the secrets of the land, to investigate suspicious monks and aged battle lords, and to combat menacing foes. Troll Lord Games' debut d20 System adventure is available again to thrill Third Edition players everywhere. Set in the World of Erde, A Lion in the Ropes easily adapts to any fantasy camapign setting with minimal work.